The thing about Jim Stroud is that he’s da bomb. Like as in mind explosion. He has done it multiple times with his presentations. The way he searches, the way he YouTubes, and the way it socks it to you with his keynote sessions. He’s one of the reasons I’ve built so many CSEs (Custom Search Engines) focused on pulling contact information. These were the first two CSEs I built three years ago, and they still work like a charm. I also caught one of Jim’s presentations at NAHCR a few years back too. I remember because he came and sat at the table I was sitting at, pretending to be an unknown attendee in the mix. 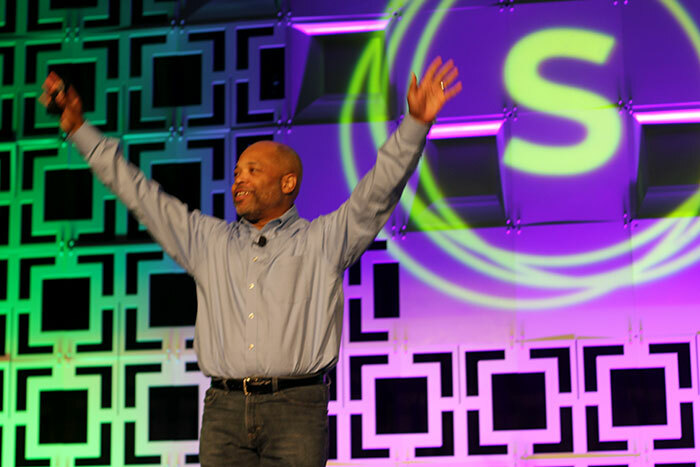 I took the chance to tell him, “I know who you are Mr. Stroud, your presentation at SourceCon helped me build several CSEs.” Yup Jim, that it was ME back then. So in SourceCon Vegas, I got to mention some of this while presenting on the Anonymous Track. And now I’m suggesting it here because his keynote sessions are always sessions you don’t’ want to miss. Whether it’s sourcing YouTube or unlocking contact information, his slide decks always bring humor, fun, and a ton of innovative sourcing. Several of us caught him in real life (IRL) at SourceCon Atlanta. Here are his keynote session bomb drops. Topic: Opposition Research in Politics and How it relates to Sourcing. Mostly this is “connecting the dots” based on researching a competing entity. Trends, social media, polls, a candidate’s history and relationships are all analyzed to develop the next course of action. I like to think of this as the anti-persona, instead of looking for examples for marketing, these folks look for negative stuff or discord. So how does this relate to sourcing? Research, we do this but I like to think with a more positive spin on it. Sourcers use competitive intelligence to target the right audience and connect them to jobs. We don’t want to smear the candidate; we want to reel them in. Oppositional Researchers are charged with finding and exploiting vulnerabilities in a system. Okay, that does sound like a few Sourcers I know (I plead the fifth). OSINT, aggregating profile sites, finding a hack or I consistency that leads to a wonderland of data. Totally Relatable, Bro. So what was the lesson, what’s the next big thing, what does this all mean?! What companies want and genuinely need are skilled people with empathy. People with humanity, people like you and me. People with heart. People like my friend and teammate Arlene, who lives in Puerto Rico, who has been through a worse hurricane than I have, and while out dealing with a sick loved one, was worried about me and my workload while back her up. We check up on each other, even though we are on different teams now. Sure, I was a full cycle recruiter for two weeks while she was out, but I understood the why. The heart always trumps negativity. This was exciting stuff Stroud, and not something I’ve seen or considered before. Then the tools were dropped. He mentioned Onet online, which similar to Relink Labs, users enter a Job title, and 87 jobs like it will come up. So being stuck on a title is a thing of the past. And he briefly mentioned, Pymetrics, a site that uses games and brain teasers to that assess people. So gamification in a sense. This is a fascinating idea, and something my team will be looking into in conjunction with hackathons. Again, a different way to look at data, a different research methodology, stuff that keeps the gears of thought turning. It’s taking something and expand on it. Mr. Stroud, we know who are, and we appreciate the humor, the socks, and all the sourcing jazz you bring our way. Thanks for all you do. Keep it up brother, keep dropping the bomb on us!